Also Called: Giant bristlegrass, nodding foxtail, chinese foxtail. Culms: Ascending to erect, branching at base, hollow, glabrous, often bent over. Blades: Flat, linear, 5 to 20 inches long, .2 to .9 inch wide, upper surface typically soft-hairy, lower surface smooth to rough. Sheaths: Somewhat keeled, glabrous to scabrous, margins ciliate. Ligules: Fringe of hairs on a membranous base. Inflorescences: Panicle, dense, cylindrical, 3 to 8 inches long, .5 to 1.4 inch in diameter, often drooping. Spikelets: About 1/10 inch long, 2-flowered, first glume shorter than second, lemmas 1 fertile and 1 sterile, 3-6 bristles at base of each spikelet. Habitat: Waste areas, disturbed sites, roadsides, and cultivated ground. Distribution: Principally in the east 2/3 of Kansas. 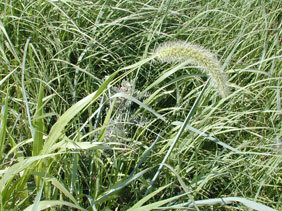 Origin: Giant foxtail was introduced from China and was first noted in the U.S. in the 1930's. Uses: Birds will eat the seeds. Giant foxtail is sometimes confused with green foxtail. Giant foxtail is taller, has a longer and wider inflorescence, and has pubescence on the upper surface of the leaves.